Apple confirmed Tuesday morning that its new 21.5-inch iMac computer will be available beginning on Friday, Nov. 30. There are two models that will launch, including a 21.5-inch iMac and a 27-inch iMac, which start at $1,299 and $1,799, respectively. The 27-inch iMac won't be available until December, however. The computers are equipped with 8GB of RAM, 1TB hard drives, a 2.9GHz quad-core Intel Core i5 processor with Turbo Boost speeds up to 3.6GHz, NVIDIA GeForce GTX 650M/660M/675MX graphics, depending on the model, and a new Fusion Drive hard drive solution, which combine the capacity of a standard hard drive with a 128GB flash drive. Both iMac models will be available from Apple's online store, from Apple authorized resellers and through Apple retail stores but, again, only the 21.5-inch model will be available on Friday. CUPERTINO, Calif.–(BUSINESS WIRE)–Apple® today announced the all-new iMac® will be available on Friday, November 30. Featuring a stunning design, brilliant display with reduced reflection, faster processors and an innovative new storage option called Fusion Drive, the new iMac is the most advanced desktop Apple has ever made. The 21.5-inch iMac will be available through the Apple Online Store (www.apple.com), Apple's retail stores and select Apple Authorized Resellers. 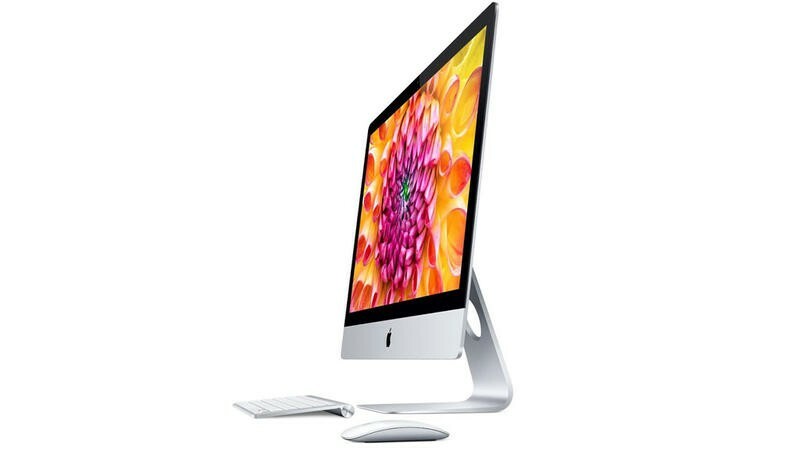 The 27-inch iMac will be available for order through the Apple Online Store and will begin shipping in December. Redesigned from the inside out, the new iMac packs high performance technology into an aluminum and glass enclosure that measures just 5 mm thin at its edge and features a reengineered display that reduces reflection by 75 percent. The new iMac includes 8GB of 1600 MHz memory, a 1TB hard drive, third generation quad-core Intel Core i5 processors that can be upgraded to Core i7, and the latest NVIDIA GeForce graphics processors that deliver up to 60 percent faster performance. Fusion Drive is an innovative new storage option that gives customers the performance of flash and the capacity of a hard drive by combining 128GB of flash with a standard hard drive to create a single storage volume that intelligently manages files to optimize read and write performance. The 21.5-inch iMac is available with a 2.7 GHz quad-core Intel Core i5 with Turbo Boost speeds up to 3.2 GHz and NVIDIA GeForce GT 640M for a suggested retail price of $1,299 (US); and with a 2.9 GHz quad-core Intel Core i5 with Turbo Boost speeds up to 3.6 GHz and NVIDIA GeForce GT 650M for a suggested retail price of $1,499 (US). The 27-inch iMac is available with a 2.9 GHz quad-core Intel Core i5 with Turbo Boost speeds up to 3.6 GHz and NVIDIA GeForce GTX 660M for a suggested retail price of $1,799 (US); and with a 3.2 GHz quad-core Intel Core i5 with Turbo Boost speeds up to 3.6 GHz and NVIDIA GeForce GTX 675MX for a suggested retail price of $1,999 (US).